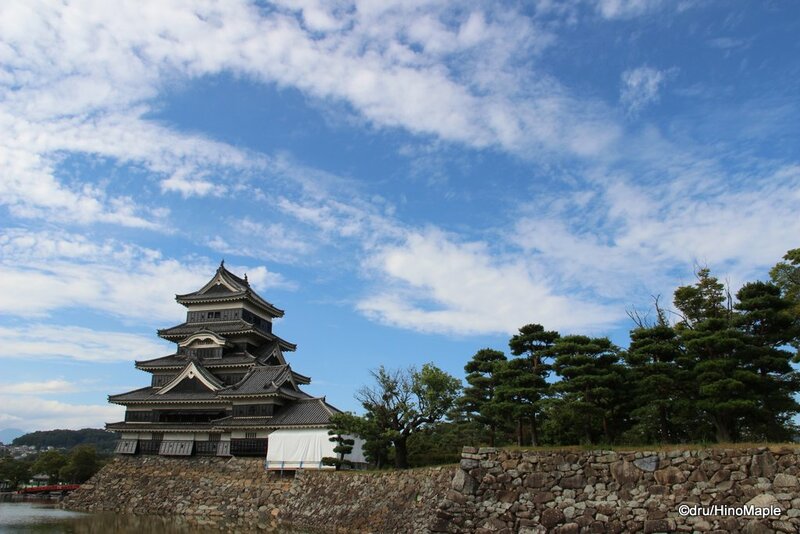 Matsumoto castle is one of the most famous castles in Japan. 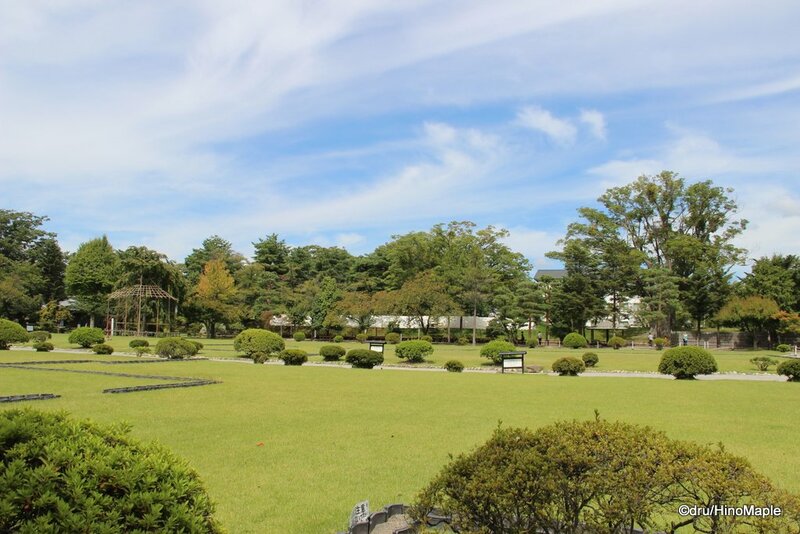 It is one of the 11 original castles still remaining in Japan, but not considered a “great castle”. 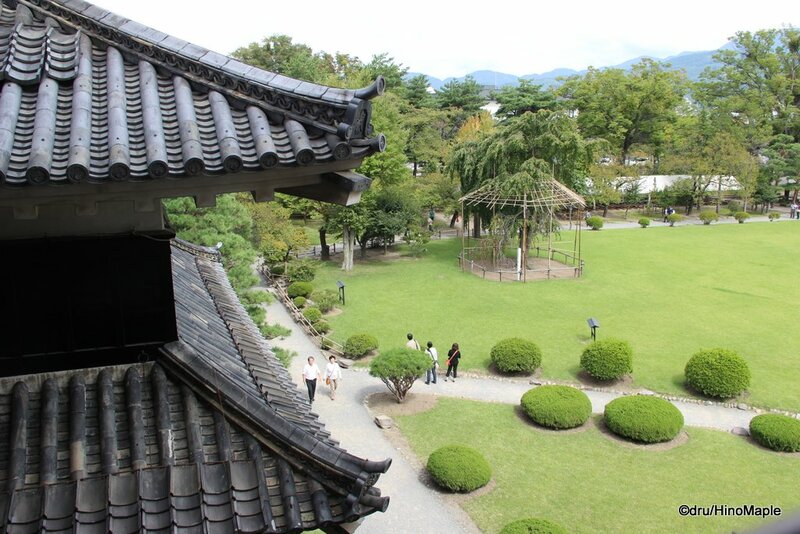 The castle was on my list as I intend to visit every original castle in Japan. I had the opportunity to go to Matsumoto for the first time this past September as I was hell bent on going to the Craft Beer Festival at the same time. I made sure I made time to visit the castle before heading to the festival, but that might have been a bad thing. 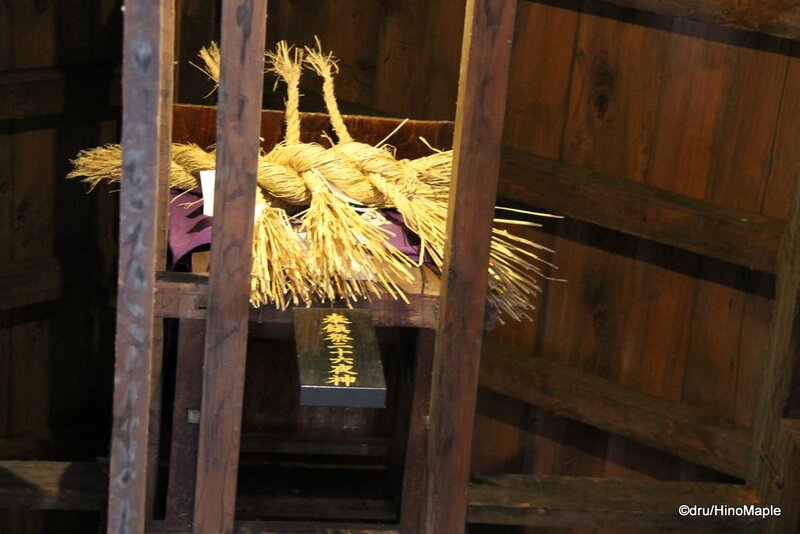 Since I was going to the beer festival, the only thing on my mind when I visited Matsumoto castle was to get some beer. I basically rushed through the castle and didn’t really spend much time looking around. Getting to the castle is pretty easy as you can easily walk there within 15 minutes. Since I was trying to enjoy the city a bit, I walked all the way there. Alternatively, there is a mini-bus that goes around the city, but the main stop is actually not on a direct route to the castle. It is probably faster to get off at the “Marunouchi” stop rather than the “Matsumoto-jo/Shiyakusho-mae” stop. When I got to the Matsumoto castle park, I was greeted by a special sign for the festival. If I went during the regular season, I would have been greeted by a small quiet park that surrounds the castle moat. Matsumoto castle is somewhat unique in being one of the rare “plains” castles, rather than being built on a mountain or some other area with a natural defense. It is also rare in that the turret is built next to the castle itself. The defense of the castle is pretty weak, if you ask me, but I’m sure they have other defenses that made the basic defense of the castle unnecessary. Once you walk through the entrance to get to the inner courtyard, you are basically at the castle. Unlike other castles that I have visited, the central courtyard is actually very small. Once you cross the moat, you pay at the entrance and walk through the main gate. You then see the entire courtyard. It is a beautiful little field of grass that really highlights the castle which is in the corner. You have to walk the outer walk of the castle grounds to get to the castle entrance as the central field is closed to the public. It can be a little confusing as to how to get there, and many Japanese people decided to jump the rope to follow the main gravel path, but I walked through a set of tables and tents because I didn’t want to break the rules this time. I decided to be a barbarian by following the rules. Go figure. Once you get to the castle, you have to take off your shoes and carry them throughout the entire castle. This isn’t a big problem as the castle is relatively small. You walk a small maze to get to the main steps of the keep. You start off in the turret next to the main castle and this requires you to go up to the top of the turret, then down a bit into the castle’s main keep. They are actually offset from each other to increase the security of the main keep. Look up! You never know what you’ll find at the top of the castle. Once you get to the main keep, you have to be very careful. 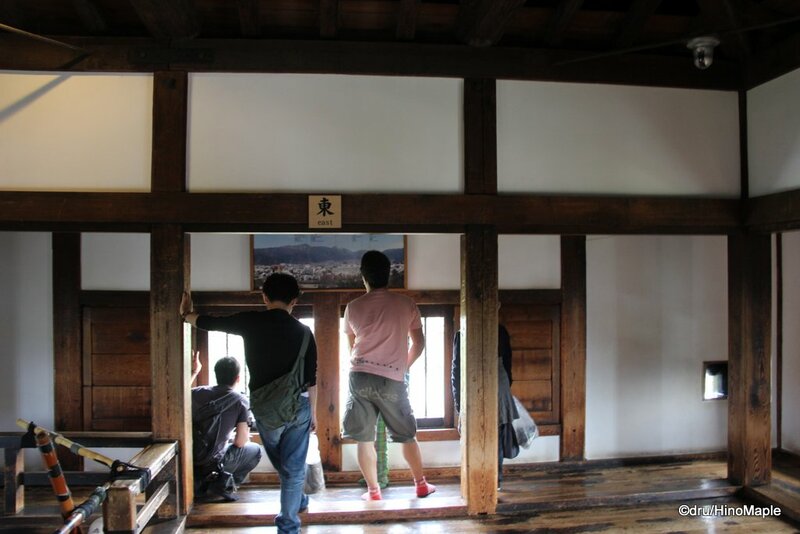 It can take a long time to climb the main castle. There aren’t many steps but climbing the final 2 stair cases is very steep and narrow. If you have a bag, or a child, it will be very difficult to go up. I couldn’t take photos because it was almost like climbing a ladder, there was always someone above me, and it is just wrong to do so. The lines to get up and down can be pretty long, so bring your patience cap. What goes up must come down, and going down the stairs is an ordeal. When you are following people with babies or infants, or trying to pass the old folk who need time to go down stairs, you just have to be patient. You basically can’t pass anyone and often sections have room for just 1 person going either up or down the stairs at a time. Once you do get down the stairs, you are outside and you no longer feel the claustrophobia from being inside a confined staircase. The breath of fresh air from the main courtyard outside the castle was quite wonderful. Once I finished visiting the castle, I took a bit of time to get a fun picture. 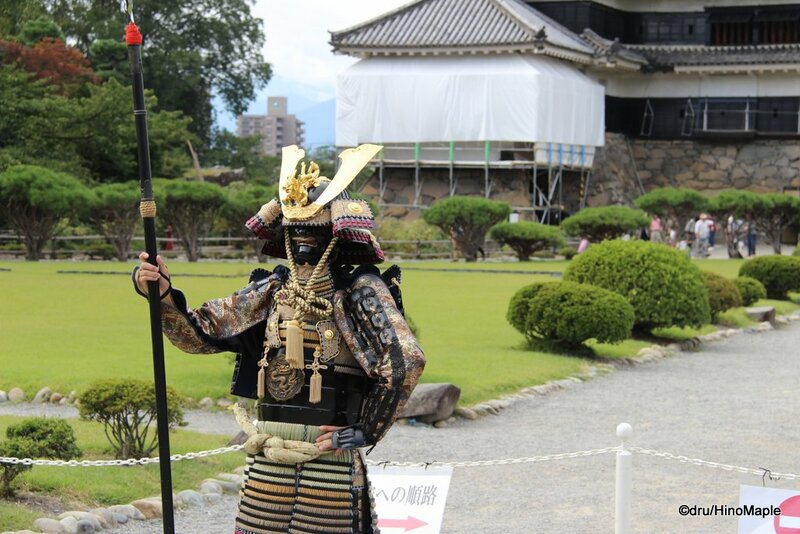 I’m not sure how often they do this, but when I visited, they had someone in a samurai costume. They actually had 2 people and when I went they just switched people. 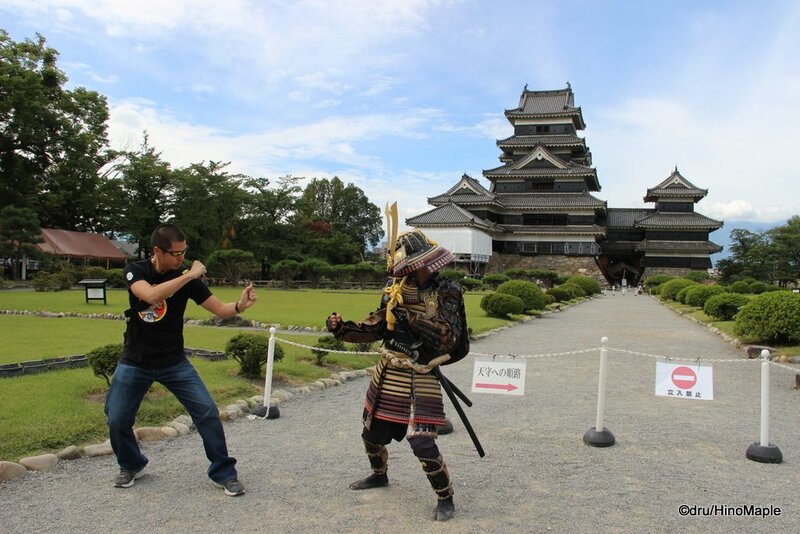 I was able to play and get into my best fighting pose with the samurai. Let’s just say I was happy afterwards and in need of a beer to celebrate my victory! 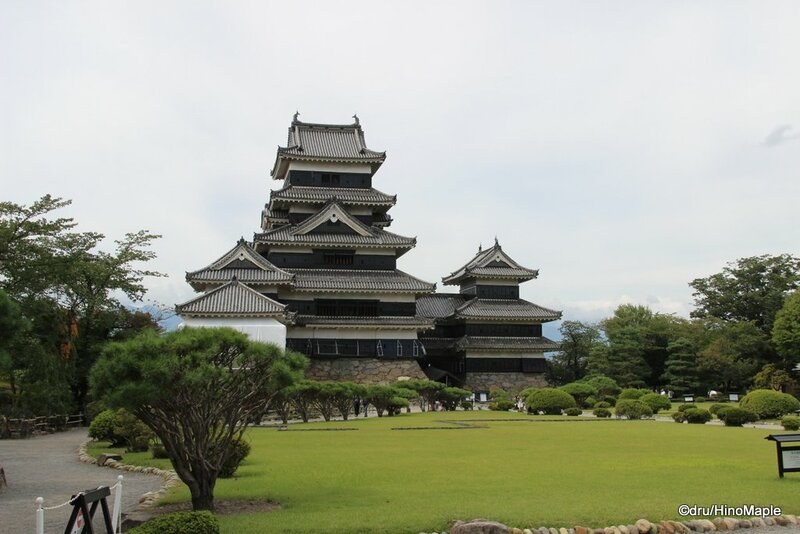 Matsumoto castle is a nice little castle, but after visiting so many other castles in Japan, I wasn’t very impressed. It is a beautiful castle and from the park, which is free, I was happy. The only interesting thing inside the castle itself is the stairs. They were the steepest I had ever climbed in Japan. I doubt I’ll ever go inside the castle again, especially since the entrance fee is pretty expensive (610JPY). For my first time visiting Matsumoto castle, it was fun, and I wouldn’t mind visiting Matsumoto again, but I doubt I’ll be going just for the castle. 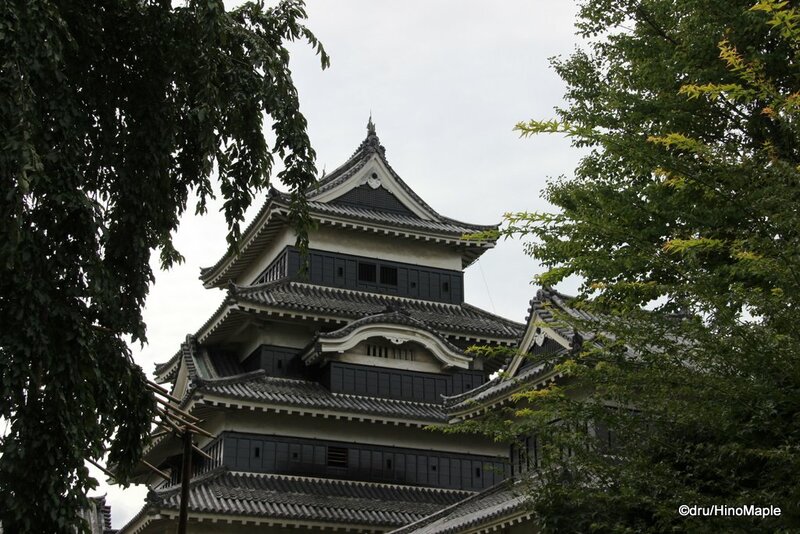 This entry was posted in Chubu and tagged Black Castle, castle, japan, Japanese Castle, Matsumoto, Matsumoto Castle, Nagano, samurai, Shinshu by Dru. Bookmark the permalink. The 5th photo is actually from the 3rd floor, I think. It is on the way out of the castle. The top is actually a lot higher but the photos aren’t as good. I think they have metal wire on the windows to keep the birds out and the people in so photos were not very good. That or they had the wooden bars for protection. You haven’t been inside a castle yet? What?! That was one of the first things I wanted to do. Although you have to go to a castle that is still original. Either reconstructed to be an original or kept as original. I’ve been to so many castles it is hard to be excited about visiting them anymore. I was about to comment, “Look, a post with no beer!” Then I got to the second-last paragraph. PS: Yes, I have maps in my head. Kinda like VR or AR or something. I guess we need to go on a walkpedition so that I can stop talking about only beer. Any ideas?